The time has arrived again for the announcement for upcoming festivals! And that means that concert boom's "Top 10 Summer Music Festivals in the US" – Sasquatch is on it's way! It's not too early to book your passes to get ready for the summer season. 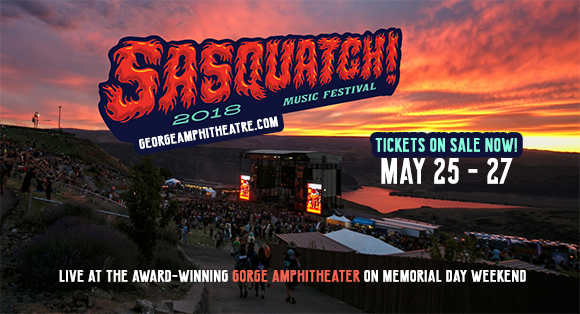 Washington has a well known love of music and what better way to celebrate than to head to Sasquatch 2018 as it brings all genre's to the stage!! Indie rock band and singer-songwriters, as well as alternative rock, hip hop, EDM, and comedy acts…. Grab your 3 day camping passes online today! Camping is the best way to really get involved in the fun and madness at festivals, so if you're planning to go to the 2018 Sasquatch! weekend then be sure to grab your passes here for the weekend! Don't miss a moment, make new friends and socialise in the summer sunshine! – There's no age restriction, all are welcome! – If you wish to drive and Park at Gorge Amphitheatre, you can for FREE, however overnight parking is not allowed. Parking lots will open from 9AM Friday. – The ticket Box Office will open at Noon on Thurs. May 24; 11AM on Fri. May 25 – Sun. May 27 (please bring Photo ID to collect). – The Line-up is subject to change.